The current view of galactic formation is that galaxies form from a "bottom-up" method. 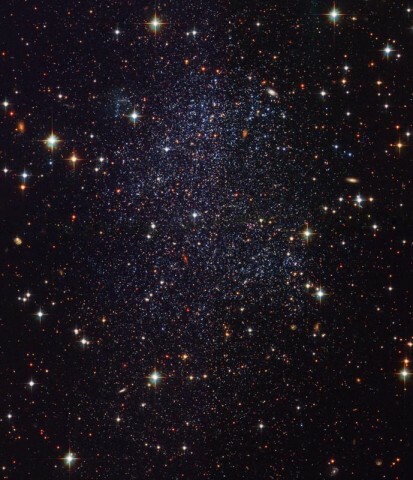 In this picture, small dwarf galaxies, full of metal poor stars, were attracted by dark matter halos in the early universe which merged into larger galaxies. 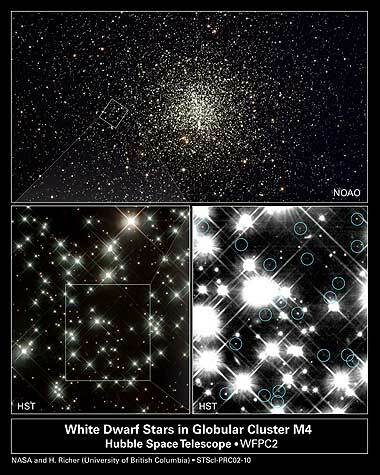 Many of those metal poor stars can still be seen today in the halo of the galaxy, but it was thought that the building blocks from which the galaxies were constructed were long gone or had evolved on their own and would no longer resemble the primordial building blocks. The solar system is passing through an interstellar cloud that physics says should not exist. 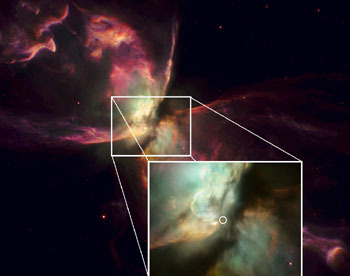 In the Dec. 24th issue of Nature, a team of scientists revealed how NASA's Voyager spacecraft have solved the mystery. 365 Days of Astronomy goes into 2010! 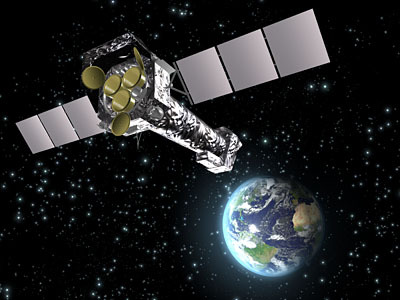 category: Astronomy Internet Tools Comments Off on 365 Days of Astronomy goes into 2010! The award-winning 365 Days of Astronomy podcast is proud to announce that the project will continue for another 365 days and is now accepting sign-ups for participants for 2010. This is a legacy project of the International Year of Astronomy (IYA) and is being managed by Astrosphere New Media Association. Though there are no plans to investigate whether Saturn's moon Titan has a Santa Claus, NASA's Cassini will zoom close to Titan's north pole this weekend. category: Cosmology Comments Off on How old is the Universe? In the field of archaeology the age of finds or the time of events can sometimes be determined relatively easily, for example via the number of tree rings or the rate of decomposition of radioactive elements. However, there is unfortunately no direct and absolute indicator for the age of the Universe. Astronomers have, however, found two ways to arrive at a good estimate. 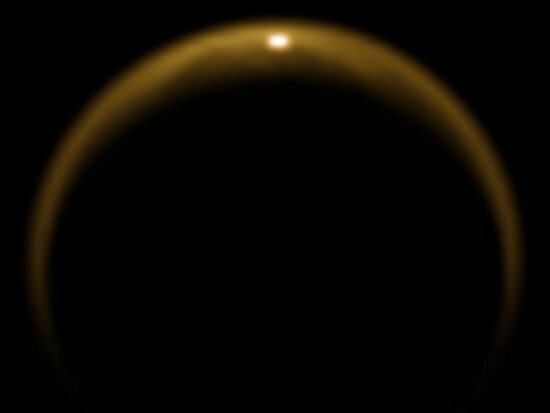 shows the first observed flash of sunlight reflected off a lake on Saturn's moon Titan. 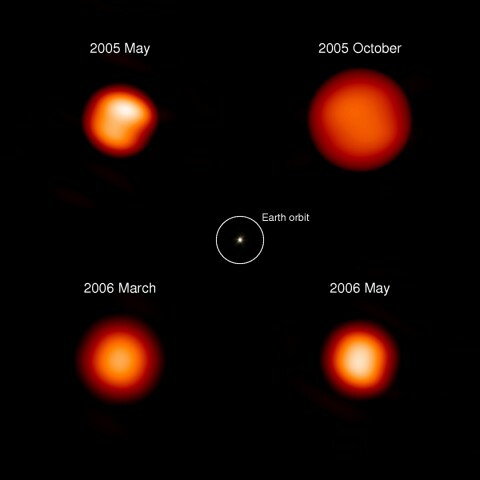 conception of Betelgeuse, is nearing the end of its life. One day our Sun will eventually die. But it won't be tomorrow ... in fact, it will only happen in 5000 million years. every 408 days due to in-and-out pulsations. 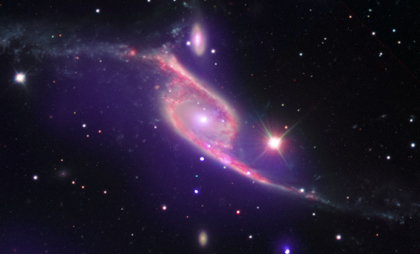 Galaxy Zoo team has launched Zooniverse. Galaxy Zoo has been an enormous success where professional astronomers, amateur astronomers, and scientists from other disciplines, have work to make discoveries about the Universe. The new website will be a platform for science projects where the public can take their pick of where and how they can make meaningful contributions to new scientific discoveries. The new infrared southern sky survey telescope VISTA (Visible and Infrared Survey Telescope for Astronomy) right here on Earth has gone online and released its first few wonderful pictures of the Universe. 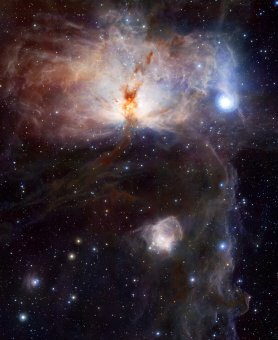 Flame Nebula, or NGC 2024, in the constellation of Orion (the Hunter). 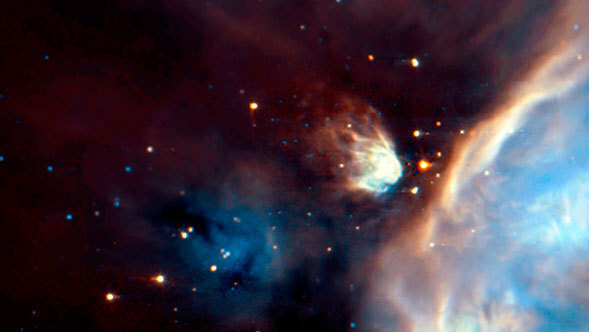 Credit: ESO/VISTA. Artists impression of the rendez-vous. Credit: NASA. 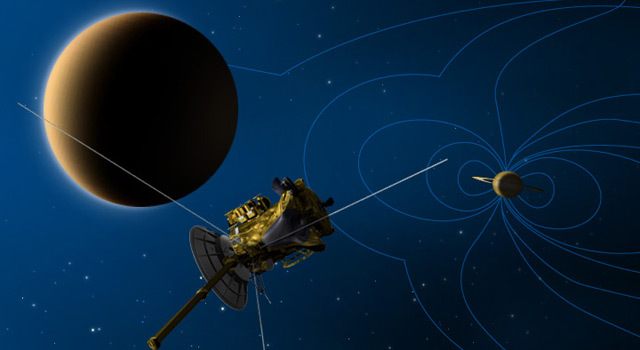 When it flies by Saturn's largest moon, Titan, this weekend, NASA's Cassini spacecraft will study the interactions between the magnetic field of Saturn and Titan. The flyby will take place the evening of Dec. 11 California time, or shortly after midnight Universal Time on Dec. 12. As Titan plows through the magnetic bubble, or magnetosphere around Saturn, it creates a wake in the magnetic field lines coming away from the planet. 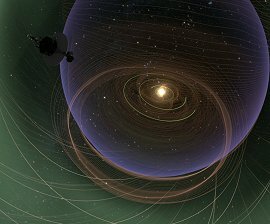 This flyby will allow Cassini's fields and particles instruments to study that wake about 5,200 kilometers (3,200 miles) away from the moon, a relatively unexamined region. Other instruments will also be taking a closer look at Titan's clouds. Bring together a small group of highly motivated researchers, grant them full access to laboratory and production facilities, remove all administrative distractions, and let them work intensively for four to six months. That’s what ‘StarTiger’ is all about! This composite image of data from three different telescopes shows an ongoing collision between two galaxies, NGC 6872 and IC 4970 (roll your mouse over the image above). X-ray data from NASA's Chandra X-ray Observatory is shown in purple, while Spitzer Space Telescope's infrared data is red and optical data from ESO's Very Large Telescope (VLT) is colored red, green and blue. Credit NASA/ESO. Astronomers think that supermassive black holes exist at the center of most galaxies. Not only do the galaxies and black holes seem to co-exist, they are apparently inextricably linked in their evolution. To better understand this symbiotic relationship, scientists have turned to rapidly growing black holes - so-called active galactic nucleus (AGN) - to study how they are affected by their galactic environments. Despite numerous attempts by astronomers across the world, the mysterious dying star at the heart of the Bug nebula - one of the brightest and most beautiful of the planetary nebulae - has never been seen before. The first image of the star at the center of the Bug Nebula (NGC 6302) has now been taken by a team of astronomers at the Jodrell Bank Centre for Astrophysics, using the newly refurbished Hubble Space Telescope. This star, one of the hottest in the galaxy, has a temperature of about 200,000 Kelvin – 33 times hotter than the Sun – and is at the center of one of the most beautiful planetary nebula in the galaxy. Astronomers have found an additional star located in the Dipper's gripper that is invisible to the unaided eye. 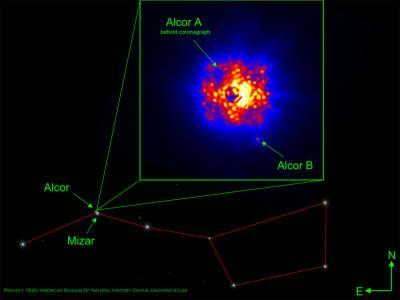 Alcor, one of the stars that makes the bend in the Big Dipper's handle has a smaller red dwarf companion orbiting it. 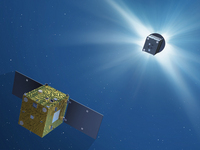 Now known as "Alcor B," the star was found with an innovative technique called "common parallactic motion," and was found by members of Project 1640, an international collaborative team that gives a nod to the insight of Galileo Gallilei. 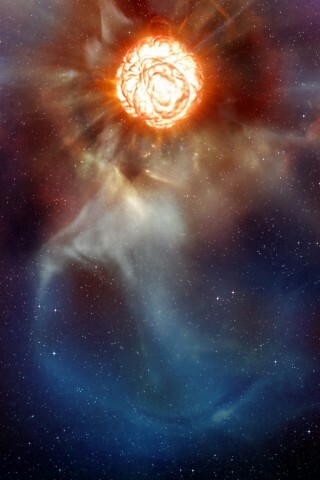 An artist's impression of XMM-Newton. 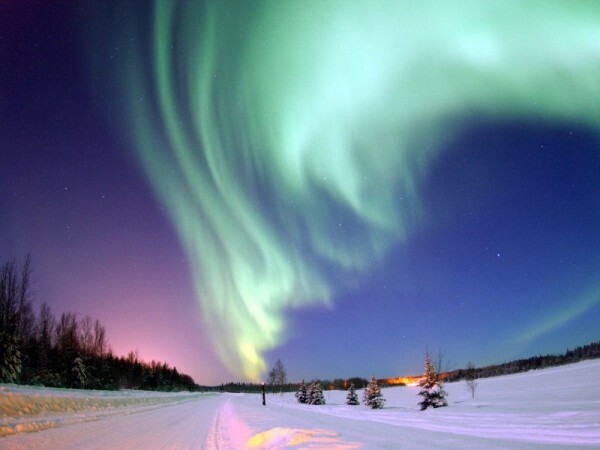 The award-winning 365 Days of Astronomy Podcast has announced that the project will continue for another 365 days, and is now accepting sign-ups for participants for 2010. Whether you're a seasoned podcaster or if you have never picked up a microphone before, anyone with a love of space exploration and astronomy is welcome to sign up to do a podcast. Image shows a portion of the Hubble Deep Field, with a potentially very distant galaxy marked by the cross-hairs.